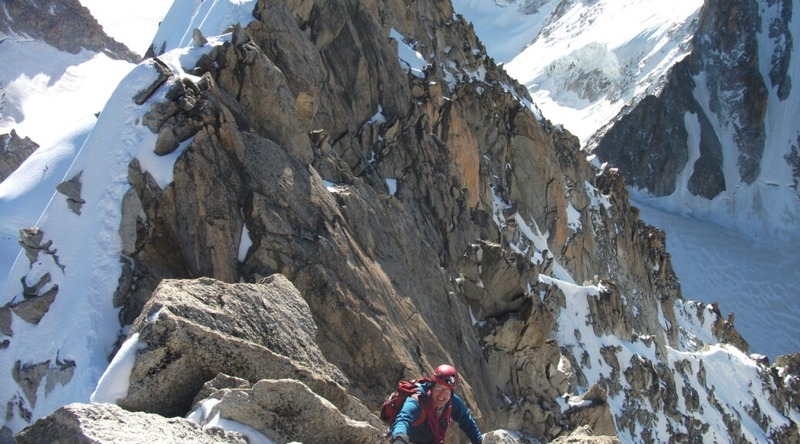 John Holterman and I headed to the Chamonix area for a weeks climbing at the end of August. Given the poor weather which had plagued the Alps this summer I was not holding out much hope for getting a lot done; but as it turned out our luck was in and we had a week of good weather and climbing. Over the first two days we climbed the Cosmiques arête on the Aig du Midi and Petite Aig Verte, both short routes by alpine standards but good climbs and perfect for acclimatization. Our confidence was building so next we opted for a longer more committing climb; the Forbes arête on the Aig du Chardonnet. We left the Albert Premier Hut at about 2.30am and with a bit of night navigation we managed to cross the glacier and find the start of the route. We were the only climbers heading to the Forbes; most of the other parties were going to the Migot spur which seemed to be a very popular climb. All went well on the Forbes, it is a magnificent route and was in great condition. The steep snow slopes and the knife edged snow arêtes offered lots of excitement and exposure. We were back at the hut by 12pm were we checked in with the guardian before a walk on tired legs to the ski lifts and back down to the Valley. The following day was to be a rest day but the weather was good so we took the cable car to L’Index and climbed the SE ridge, taking our time and enjoying the views across the mountains. We were both tired from our exploits of the previous days but wanted to make the most of the two remaining days. After considering our options we settled for the Frendo Spur on the Aig du Midi. We started from the Midi Plan station at about 12.30pm. The plan was to get as high on the route as possible before dark and bivy; then get an early start the next day which would give us plenty of time to finish the route before the last cable car left the Midi station for Chamonix at about 5.30pm. All started well, the forecast had shown rain for the morning but this did not appear. Route finding was reasonably straight forward and we were moving at a steady pace. Unfortunately the rain came later in the afternoon in the form of a thunder storm, which pelted us with rain and hail for a few hours, slowing our progress in the difficult conditions. After debating our options we decided it was better to go on as retreat was going to be difficult. As the afternoon progressed the conditions improved and we found as comfortable a spot as possible to spend the night. We started at first light, glad to be leaving out cold bivy and be moving again. Due to the conditions the day before we were not as high on the route as we had hoped, but we had plenty of time so we were not concerned at this stage. As the route progressed, the technical difficulty of the climbing increased and some fast moving parties, mostly guides with clients began to catch us. As we entered the early afternoon we still had a long way to go but were keeping pace with the other climbers on the route. We eventually put the last of the rock behind us and moved up the steep snow arête and slopes as quickly as we could. It was now 4.30 or later and we had a steep ice pitch in front of us before we would reach the snow crest below the Midi station. There was a palpable sense of urgency in all the groups pushing as hard as they could to get back to the Midi. As I pulled over the crest and pushed on up the final arête I could see the cable car pulling into the station, my legs and lungs were burning but we had to keep moving. It was 5.15pm when we entered the tunnel of the station; we crammed all the gear into our bags and ran for the cable car to join the queue along with other harried climbers and a few remaining tourists. We had made it, just. On the cable car ride back to Chamonix we could finally relax and enjoy the sense of reward from completing such an epic route with some of the other climbers we had met along the way. Once down we headed back to our accommodation, washed, ate and packed our bags in readiness for heading home early the following morning.